The Common Swift is a widespread summer breeder throughout Eurasia. Mostly it breeds in holes and gaps in buildings, or in nest boxes and crevices in cliffs. We present here an interesting case that some Common Swifts occupied nests of Red-rumped Swallows. This has been recorded since 2011 in Beijing, China, where the Swift is now facing the challenge of the lack of nesting places. The Swallows nests are built carefully with mud, so the nests will usually last at least one 1 year (i.e. to next breeding season). As the Swifts will arrive in Beijing slightly earlier than the Red-rumped Swallow, they thus have the opportunity to take over the Swallows nests. Further observations are needed on the potential for conflict between Swifts and Swallows, and the breeding performance of Common Swifts in a Swallows nest. In most cases, Common Swift (Apus apus) breeds in caves or holes of buildings (Alerstam & Högstedt 1981), or in nest boxes (Lack 1951). There will be competition occupancy of nest sites between Swifts and other common hole-nesting birds, such as House Sparrows (Passer domesticus) and Starlings (Sturnus vulgaris). However, it has been reported that Common Swifts also choose some unusual nest sites. For example, Moore (2012) noted that a group of Common Swifts had exposed nests on the metal beams of an open garage, at Andalucia, Spain. Moreover, according to occasional reports in Europe (e.g. Ireland, France and Germany), Swifts can even occupy the nests of House Martins (Delichon urbica) (Wendt 1988; Raitière 2010). Suitable nesting habitat mostly in ancient constructions for Common Swift (A. a. pekinensis) is dramatically being lost and fragmented due to development in Beijing, China (Qiu 2006). However, Swifts are looking for alternative nest sites. Here we report that the Common Swift is trying to use old nests built by Red-rumped Swallow (Cecropis daurica), which is also a fairly common breeder in Beijing like the House Martin in Europe. We started to observe this phenomenon from 2012 at two sites near the National Stadium ("Bird's Nest") for the Olympic Games (Beijing 2008), in the north of Beijing, see Fig. 1a and 1b. Figure 1a. Site 1: Yellow arrow shows the location of occupied nests, about 250 m to the East of the National Stadium ("Bird's Nest"). Image of landscape taken from Google Earth. Figure 1b. Site 2: Yellow arrow shows the other site of occupied nests, about 1250 m to the Southwest of the National Stadium ("Bird's Nest"). Image of landscape taken from Google Earth. Site 1 (Fig. 1a) is an apartment of 14 floors. Totally 19 nests were found in this building. These nests were built by Red-rumped Swallows in 2011 or even earlier. The locations of each nest are numbered and shown in Fig. 2. According to our observations during June and July of 2012, there were three pairs of Red-rumped Swallows and approximately 15 pairs of Common Swifts using these nests (see Fig. 3). Figure 2. (a) An overview of the 19 nests in the apartment at site 1. The lowest nest is on the 4th floor, which is the 3rd floor in Europe (the 1st floor in China equals to the ground floor in Europe, so the 2nd floor in China = the 1st floor in Europe, and so on), the height of which is about 18 m from ground. (b) Zoom-in details (numbered and circled) of the nest No. 1, 2, 3, 8 and 9, showing the general locations of these nests. Photo by Lei Zhu (a) and Zhi-jian Yin (b). Unfortunately, this building has been under repair since the spring of 2013, so we didn't record any Swifts or Swallows in 2013 and 2014. Site 2 (Fig. 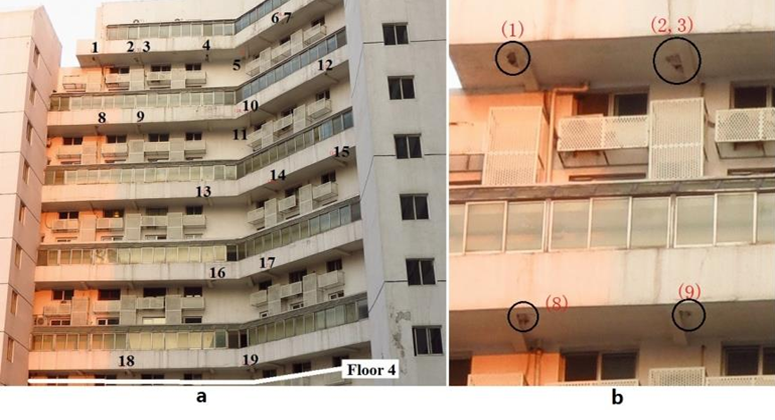 1b) is a 12-floor apartment, but only 3 Red-rumped Swallow's nests were found, two of which were used by swifts in in 2012 and 2013, while only one pair of Swifts was recorded in the breeding season of 2014. The outer structure of this apartment is similar to the building at site 1. The nest and activity of Swifts are shown in Fig. 4. No Swift was found in 2011. This year we have observed Swifts here since early April, but Red-rumped Swallows still haven't arrived. Figure 4. The Swallow's nest and its current user, Common Swift, at site 2. Photo was taken at 08:18, on 15th July, 2012. Photo by Lei Zhu. Generally, the breeding population of Common Swifts arrives in Beijing from early April (Median arrival date = 4th April, N = 7 years), which is about two weeks earlier than the arrival of the Red-rumped Swallows (Median arrival date = 19th April, N = 7 years). The Swifts thus have opportunities to occupy the old nests of Red-rumped Swallow. However, Red-rumped Swallow always uses and repairs the same nest every year. Therefore, there will probably be fights when the swallow detects that its nest has been occupied by a Swift, and the winner seems to be the Swift at least in site 1 and site 2, although we didn't record any fighting around the two sites. Another interesting question is that Common Swift cannot take mud to repair the swallow's nest because they can only collect airborne material in flight to make their nests. In addition, the Swift is loyal to the same nest every year (Tompkins, Jones & Clayton 1996). As a consequence, the Swallow's nest will be used without any repair for several years, which will cause damage of that nest. One more similar case has been observed in Guangzhou, a city in the south of China, where we found that the House or Little Swift Apus affinis, a common resident there, sometimes takes over the nest of the Red-rumped Swallow. In these cases, the Little Swift usually does some repairs on the swallows nest (i.e. puts some feathers around the entrance). This is not very common, but happens every year around the city. We will keep observing those Swifts to find whether there is fighting between Swift and Swallow, and if the Swifts can try to repair the nests. The reproductive success of Common Swift in Swallow's nest is also an interesting topic although we haven't had any such observations because it is difficult and risky to observe chicks in these nests, it will disturb the breeders or even destroy the nests. Volunteers of the Beijing Birdwatching Society are trying to find other sites where swifts occupy the nests of Red-rumped Swallow in 2013, and other interesting nest sites of Common Swifts.